Home builder Luis Imery has built a home any homeowner would be proud of, the first U.S. Department of Energy-certified DOE Zero Energy Ready Home in the state of Georgia. The Proud Green Home was constructed in Serenbe, a 1,000 acre community located 30 minutes south of Atlanta that aims to be a national model for balanced development focused on land preservation, agriculture, energy efficiency, green building, and walkability with a land plan that calls for preservation of at least 70% of the natural hill country acreage, while accommodating at least as many homes as a traditional subdivision which would disturb nearly 80% of the acreage. 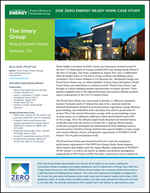 ProudGreenHome.com is the world’s premier news and information site dedicated exclusively to high performance, sustainable, and “green” strategies, systems and products for homes.